Honoring the New York State Troopers from Troop L who have made the ultimate sacrifice. Sr. Inv. 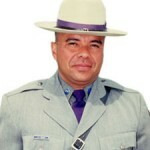 Laurence L. Hemmerich Jr.
Trooper Jose A. Rosado, Shield 4411, was born on Feb. 25, 1961 in Puerto Rico. Tpr. Rosado came to the U.S. mainland after graduating high school and always aspired to be a law enforcement officer. Tpr. Rosado worked as a New York State Corrections Officer for 4 years before he became a New York State Trooper. After graduating from the New York State Police Academy in 1988, Tpr. Rosado was assigned to Troop L where he served his entire career. Tpr. Rosado had an excellent sense of humor and was a pleasure to have around the barracks. He was married and had 2 children when he lost his life on Jan. 24, 2007 when his Troop car lost control on an icy road and was struck by another vehicle in East Quogue, NY.